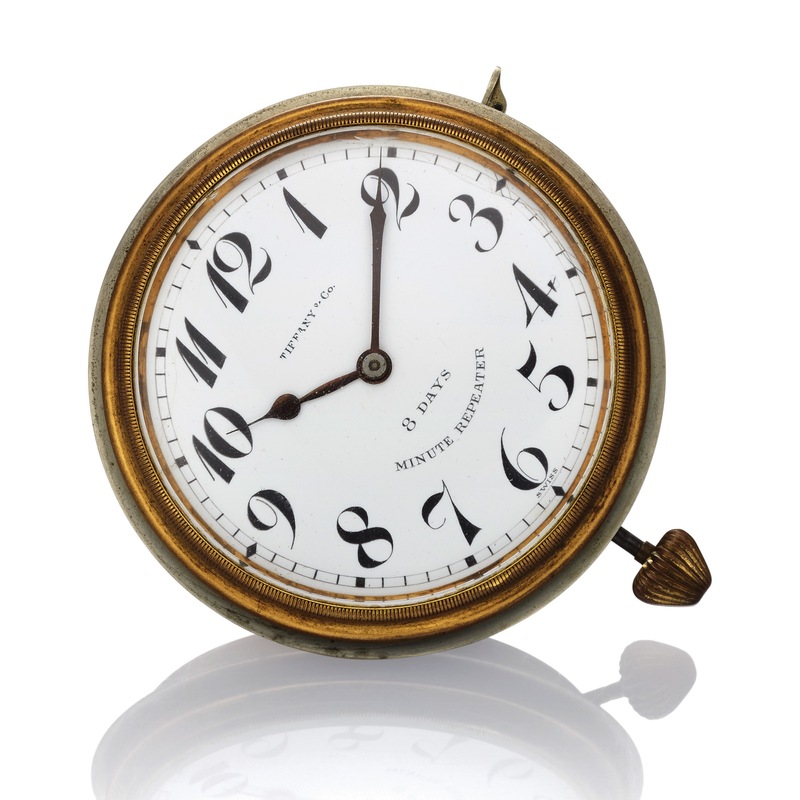 TIFFANY 8 DAYS MINUTE REPEATER TRAVEL CLOCK Tiffany & Co., made by Harold Watch Co. Swiss circa 1920. Fine, base metal, keyless, eight-day going, minute-repeating traveling clock (outer case missing). Accompanied by a box. Three-body, hinged case back, reeded stepped gilt brass bezel. White enamel with painted Breguet numerals, outer minute track. Blued steel spade hands. 48 mm. (21'''), nickel-plated, 15 jewels, straight-line lever escapement, cut bimetallic compensation balance with Breguet balance spring, patented "silent" governor, repeating on gongs by activating slide in the band. C. Three-body, hinged case back, reeded stepped gilt brass bezel. D. White enamel with painted Breguet numerals, outer minute track. Blued steel spade hands. M. 48 mm. (21'''), nickel-plated, 15 jewels, straight-line lever escapement, cut bimetallic compensation balance with Breguet balance spring, patented "silent" governor, repeating on gongs by activating slide in the band.